We’re all talking about networks nowadays. Like the internet unleashed a realisation that our lives are, in fact, a lot more interconnected and complex than we used to imagine. 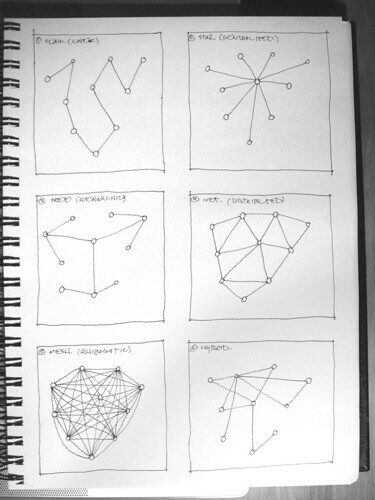 But what exactly do we mean when talk about networks? And how can we make better use of them in planning and managing the complexity around us? I’ve been doing a fair bit of thinking around the subject for my PhD of late (it’s going well, thanks!) and thought Id share some of my meandering thoughts. If you’ve read my blog previously – or seen me present – will know that I’ve mentioned Manuel Castells a few times before. In later work Castells also looked at how power – as communication power – is shaped by networks. But despite Castells’ legacy, the more I read and thought about and experienced networks I couldn’t help find Castells’ work – although compelling – unsatisfying. For example, trying to get my head around how networks produce qualitative differences characterised as complexity I found that Castells’ logical or structural analyses that address quantitative differences, for example, the increased connectivity of network making more things happen and faster couldn’t adequately account for the full range of networked phenomena we experience on a day-to-day basis. Thinking about this I decided that the problem might lie with Castells interpretation of networks from the perspective of technological evolution, that is: as telecommunications networks. While this enables us to view different elements of our world as being networked, it locks us into thinking of networks as point-to-point systems of communication or organisation. Castells applies this analysis to social groups, businesses, political campaigns, etc. But what about if we consider that rather than the Network Society arising thanks to newly empowering technology – whether the telegraph or the smartphone – networks, in fact, constitute our existence at a much deeper level as well as manifesting how we live or experience our lives. This perspective comes to the fore perhaps most vividly in the work of Gilles Deleuze (and also his work with Felix Guattari) who gives us a different interpretation of network: as a rhizome. Firstly, (and without getting too deep into Deleuze’s philosophy!) we need to unpick the idea of the rhizome which is actually a sort of metaphor (or ‘image of thought’ in Deleuze’s lexicon) to account for Deleuze’s broader philosophy of difference or multiplicities. Rhizomes, then, are a type of networks constituted as “a series of productive connections with no centre or foundation” (Colebrook 2002, 156). What this means is we have a way of interpreting networks as a potential form for endlessly connecting things in the world in a way that produces complexity. Another theorist that has adopted rhizomatic networks, Bruno Latour, complains that Castell’s dominance in network thinking has led to a situation whereby the concept of the network unproblematically accounts for the transformation of things (information mainly) without “deformation”. On the contrary, the rhizomatic network that Deleuze and Latour discuss bring about “transformations” that problematise the point-to-point linearity of telecommunication networks. So Deleuzian networks are systems of emergence with unknowable outcomes – or at least engender a complexity which makes knowing or predicting outcomes difficult. As such, they connect people and things to one another in ways that ensure an always open and endless flow of possibilities. As vague and abstract as this might sound I believe it gets us closer to a better understanding of the potential for networks to account for the world around us – both as we exist within it as well as how it organises our lives. I’ll hopefully follow this post up with a more applied look at rhizomatic networks and their relation to assemblages, something Anthony Mayfield and Dan McQuillan have already started to explore. Returning to work after the Xmas/new year break I found a surprise on my desk. Someone from Brazil – still unsure who – had sent me a gift package from the fabulous sustainable and eco-friendly skin and bodycare people, Natura. It’s also a very presceint inscription as I’ve been doing a lot of thinking and writing about networks – including the organic variety – of late. I’ll take this gift as a sign to share my thinking.